Last week marked my one-year anniversary with ShipStation (Austin-based SAAS Ecommerce Shipping) and I was, frankly, too busy and excited about what I’m working on there to post to my personal blog. So, the year has been crazy, awesome, stressful, wonderful, strange, fun, busy, and almost nothing like I expected it to be like. That last part is GREAT as I didn’t leave Calendars.com to keep doing the same old things. 2. I’ve been here for ~20 years – That makes me a local, right? My post on Tuesday was lacking. It’s probably best for you to read that post before reading this one. Why, you might ask. What was missing? Well, the BIGGEST factor to my success was missing. I did a bunch of things to go from zero to McCoy’s, but it’s during my time at McCoy’s that things really changed. Not only did I get my first real-world (outside of eBay) taste of ecommerce, I experienced a life-altering change that I may or may not write about someday. During and right after that change, I fell as deep as a person could in love with the woman who would be the true and “behind the scene” reason for my current success and for me being where I am today. She was literally the only one, at the time, who was 100% in support of me and what I needed to do next. She was someone who challenged me to be better, push me in positive ways, and believe that I could move forward. I met Sarah, almost literally, “on the Guadalupe river” while tubing during a fraternity alumni weekend event. We were both at the event with other people. Again, that’s something I might write about some other day. This was just when we first met. It was later that the sparks really flew. Sarah has been a source of support for me the entire time we have known each other. We have been through so much together. My change from McCoy’s to A.S.S. My grad-school days at St. Edward’s. We did at least one home remodel in that time and she gave birth to our first child less than 30 days after I graduated. She supported my, possibly irrational-jump, to Adlucent and she had my back when I was “let-go” less than a year later. She listened to me worry (whine) and she always told me that we would be OK. She was, of course, right all along. She supported my attempt at consulting while she put in long hours at her office and I did my best to take care of our one-year-old daughter. Calendars’ offer and opportunity was the right next step for me career-wise and Sarah was right there, as always, weighing out all the pros and cons. She has this awesome ability to dig into the details of the pros and then turn on a dime and analyze the cons. I’m not sure if it’s just in her genes or if it has to do with the urban planning masters she has from the University of Texas. Either way, I’ve learned to step back a bit when we are debating something as she will always, and to our benefit, flip the conversation to the other side. Many “Flip Days”, two more kiddos, and now my most recent change, Sarah continues to be the rock of the family. I’m able to take risks in other parts of my existence because of her. I can try to tell her how much I appreciate her, but it would never fully acknowledge or equal what she has done for me, for our kids, nor what she will do for all of us in the future. Sarah, I Love you and appreciate everything you do for me and the three little ones so much. Thanks for all you do and have done to get us to where we are today. Yesterday, I resigned as VP of ecommerce marketing and analytics at Calendars.com. The news was released internally and to our partners today. Those of you who are friends of mine on Facebook have seen my string of change related quotes throughout the day. Well, the change I was referring to was not just the everyday and ongoing changes we all face in life, but also my move from Calendars.com to Austin-based tech start-up ShipStation. We often find ourselves in situations which are comfortable enough to continue but often these situations are not close enough to perfect for happiness. I found myself in this situation recently and decided that it was time to make a change. It was time for a change as big as the change I made over 12 years ago when I moved from the financial services industry to retail/marketing/ecommerce. That move was so perfect for me and my new company at the time. McCoy’s Building Supplies was looking for possibly the oddest combination of skills ever. They needed a web/html savvy person who could also coordinate marketing for a private-label credit card. I had recently finished a short stint at Wells Fargo after previously being with Ford Motor Credit. Check the box for marketing a private-label credit card. My dad was a closet computer geek. He exposed me to computers at a very early age. 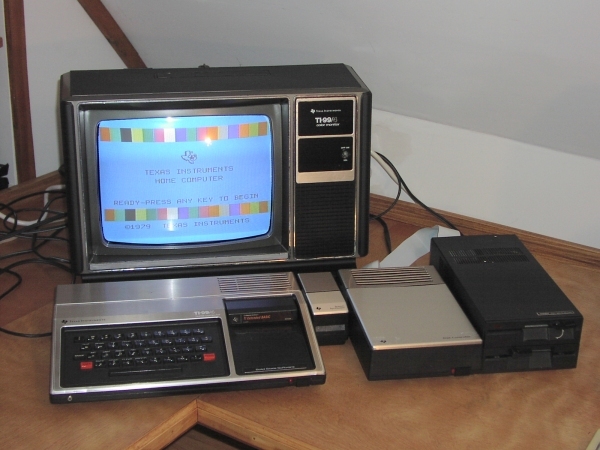 (TI-99) Later, with the help of Coffee Cup Software (Thanks Nick Longo), my dad helped me learn how to code websites. I put a few college organizations on the interwebs. My dad later turned me on to eBay and the world of ecommerce. Sell some old Ford parts via eBay? Sold! Check the html/web savvy box as well. Throw in the fact that there was a McCoy’s Building Supplies in my hometown of Weimar, TX and we were a match made in heaven. I became the webmaster and private label credit card marketing coordinator for McCoy’s. What a change! In 2002 -2003, I helped McCoy’s launch a very primitive ecommerce site. It lived as part of the basically brochure site we had built and it sold only one product line, Mighty Mule Automatic Gates. It was glorious in my opinion and I was hooked. We only sold the gate line as it was the first vendor I was able to convince to drop-ship for us (for free). We outsold every brick and mortar McCoy’s location when it came to the gate line since I could merchandise the entire line and not just the top couple of sellers that the stores would carry. Proving out ecom inthe early days was so much fun! The dev house we used to build the ecommerce part of our site assigned a young hotshot to the project. He was cutting his teeth with this project and I was as well. More on him later. Good times were had as we learn the ropes of ecommerce. I had seen the Calendar Club building out on Burleson Road just east of Academic Superstore’s offices. I knew they were the ones who ran the calendar kiosks in the malls, but I had no idea that Calendars.com even existed. I was a smart phone and Outlook person. I hadn’t owned a paper calendar since the early 90s. Frankly, I thought someone at A.S.S. or from grad school (I had recently wrapped up an MBA in ecommerce from St. Edward’s) was playing a joke on me. I was intrigued as the AOV (average order value for a calendar is much lower than that of software and I felt challenged to make my online maeketing ROi rules work on such a product.) A few phone calls, at least one meeting later and I was in the pipeline to another change. My time at calendars has been great. I’m so proud of what my team has accomplished. I’m glad to have partnered with some great companies over the past 4 years. We moved the site from a home-grown system to ATG. We launched Bazaarvoice and have enjoyed having them as a local partner. We moved from Axiom to e-Dialog for email. We continued and grew a long-standing relationship with Coremetrics. We launched and became huge advocates for Monetate. The list goes on and also includes growing revenues by ~30% in four years. As I mentioned before, sometimes things just aren’t perfect and I found myself in need of the next change. Remember that hotshot dev guy I mentioned earlier? The one who helped me get McCoy’s on the ecom map? Well, he went on to create a few businesses and most recently, Byron Weir became the co-founder of ShipStation along with Jason Hodges (who was actually at the same dev house we used while I was at McCoy’s). Nathan Jones, founder of Academic Superstore recently became CEO of ShipStation. I am beyond excited to join forces with two folks who were so instrumental during my ecommerce journey. I’m excited about this change and about having them be a part of it.